We learn from each other - our experiences, our unique passions, and our skills. The resources below are to assist your exploration health. Learn what is impacting your health, visibly and invisibly. Pickl-It: The original anaerobic airlock jar system. Read Kathleen’s story, the mastermind behind this concept, and learn about her passion. All people residing in the U.S.A who are interested in this system of fermentation should purchase these jars through Pickl-It or the Probiotic Jar, below. The Airlock Fermenter is restricted to sales in Canada, but Canadians should free free to purchase from the the original mastermind – don’t worry, you will not hurt my feelings. I just want you to start fermenting! The Probiotic Jar: This is another company that sells the airlock jar system, using Bormioli Rocco Fido jars for the perfect seal, guaranteeing complete exclusion of oxygen. This site also has fermentation video classes to empower you in fermentation. Take fermentation to a the highest level with their online Foundation for Functional Fermented Foods Seminar. 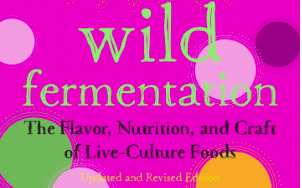 Wild Fermentation: Author and fermentation master, Sandor Katz, is famed for reviving fermentation. Buy his books to understand the breadth of fermentation, including grain, vegetable, dairy, legume, vinegar, wine, and beer worldwide. He presents many different styles to fermenting. Find one that suits you. The Nourished Kitchen: Fermentation is one part of this website that advocates for traditional food practices in line with what Weston A. Price recommended. Jenny has wonderful recipes, including those for ferments, which are easily adaptable to use with the Airlock Fermenter. Redmond Real Salt: This salt is included in all the Airlock Fermenter jar bundles and used at the fermentation workshops. It is an unrefined dry sea salt with a wide mineral and trace mineral content. The only ingredient is sea salt! It is available in powder, fine, kosher, and coarse grain size. Fine grain is adequate for all self-brining and brine-pickled ferments. 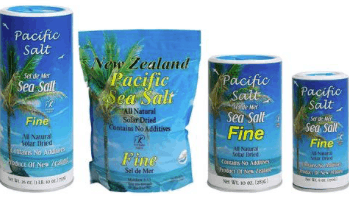 Pacific Salt: Among all the unrefined sea salts available, Pacific Salt is the cleanest, according to recent analysis. Experiment with it. In Canada, it is available for purchase at Planet Organic. Each salt imparts its own unique flavour. Experiment with various unrefined sea salts to determine the flavour you prefer. International Scientific Association of Probiotics and Prebiotics (ISSAP): A evidence-based website sharing the latest on probiotics and prebiotics with many consumer resources to help make the science understandable. Find many good fermentation articles to understand the health link. Canadian Digestive Health Foundation (CDHF): Get information for specific digestive conditions, along with helpful preventative tips for keeping your gut healthy. My Gut Matters: Learn from Karina, a microbiologist focusing on the skin microbiome as well as supporting your intestinal microbiome. Environmental Working Group: Download the Dirty Dozen and Clean Fifteen produce list to know which fruit and vegetables rank the highest for pesticide residues. Foods on the Dirty Dozen list should be purchased organic or replaced by other lower residue foods. Skin Deep: A division of the Environmental Working Gorup, this database ranks personal care products based on ingredient toxicity. Use it to find products that are ranked 1 or lower, i.e. toxic-free. Environmental Health Clinic, Women’s College Hospital, Toronto, ON: Finally, a health institute made for people with invisible illnesses, such as chronic fatigue syndrome, fibromyalgia, and environmental sensitivities. Read past Environmental News newsletters and find patient resources. Dr. Magda Havas, Ph.D: Dr. Havas simplifies the science behind invisible yet powerful waves and explains the link to many illnesses, including CFS, MS, and rapid aging syndrome. Electric Sense: Biweekly interviews with leaders in EMF’s from around the world provide interesting perspectives of mitigation of EMF’s and recovery options for people with electromagnetic hypersensitivity. Environment Health Trust (Devra Davis): Dr. Davis, an epidemiologist, has studied and published extensively on the health impact of man-made electromagnetic radiation, namely wireless technology and cell phone towers. This site will teach you the undeniable link between wireless technology and cancer.